Keep up on my writings with my newsletter! "For my second 'official' Focused Fandom book I focused on something I was familiar with - artists. I'd known plenty of artists over the years, almost all of them originally fanartists or who enjoyed it as a hobby. I'd also seen talented artists make a living with their considerable skills. So it was a natural fit - but when the book balooned to well over three-hundred pages, I realized how much I had learned doing the interviews for it . . ."
Let's face it, there's something unique about the fanart world - of working with pre-existing properties, navigating cultural questions, and more. It's time to look in depth at the specific culture and career issues that people may find - and face! 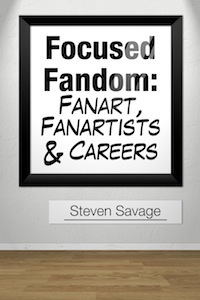 The result of extensive interviews with a variety of fanartists (many who are or will be pro), "Focused Fandom: Fanart, Fanartists, and Careers" is a guide for you and everyone you know to help you use fanart in your career. Easy organization - Three major sections help you focus on the advantages, career options, and career must-dos for people interested in cosplay and costuming. Each section is subdivided helpfully. A variety, ideas, and suggestions - Zoom in on what's going to help you the most! Exercises, challenges, and next steps - Don't just get advice - get guides to what you should do next, while you read the book! Quotes from artists, graphic designers, and more - Get unique, personal insights from a variety of people just like you! Available in multiple formats - PDF, ePub, or Kindle!